Oops a little late sorry, but I'm here. I have been a bit busy this week putting together the Guild newsletter which I edit and couldn't quite fit in getting this written too. 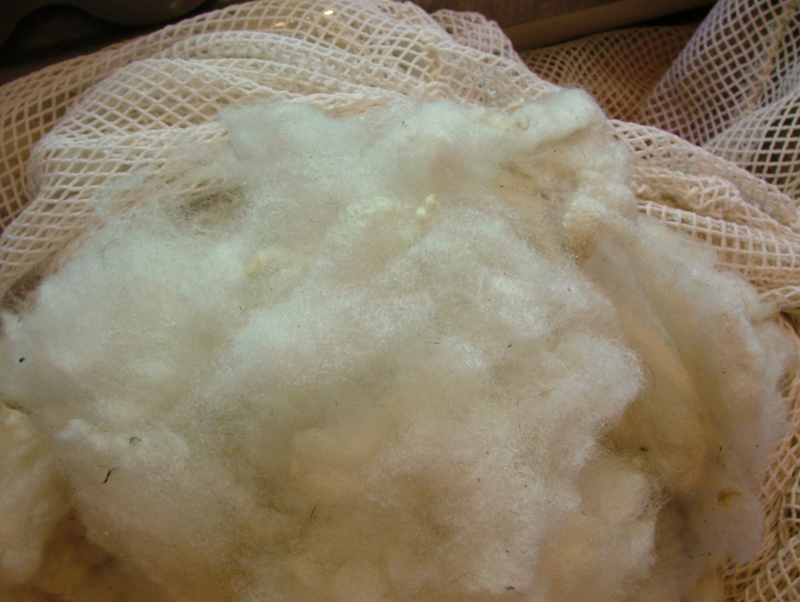 So what have I been doing, well acquiring fleece for a start, and yes quite a bit. More than I need or at least more than I can house, but at least the extra insulation for the house is good. I have spent some time skirting the fleeces with the dirty bits being used at the allotment for mulch and deep bed troughs to help with moisture retention. The rest is bagged and labeled. I shall be offering some of these either here or elsewhere soon so if you are looking for any, let me know by leaving a comment. I would only ask for postage to be covered. 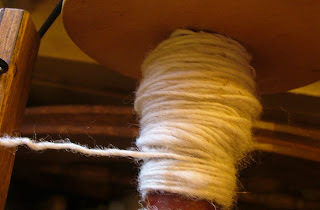 A few weeks ago we went to the local museum farm for the day, where we saw some of my friends from the Guild demonstrating. It brought back lovely memories for me as this was where my spinning journey started just 2 years ago and where I first met the Guild, and the wonderful lady who let me have a go on her beautiful wheel. The farm were demonstrating shearing that weekend so there were these lovely big bags of fleece! Well I couldn't be rude and not bring one, or two, or was it three home with me now could I? Especially as one was a shearling (first shear) Dorset Horn. The other two were Dorset Horn too. The shearling was filthy but came up clean after washing and is sitting waiting to be carded. 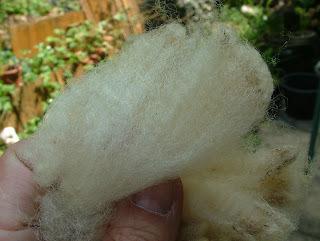 Onto the tale of the broken fleece (yes, finally I mention what the blog post is about). 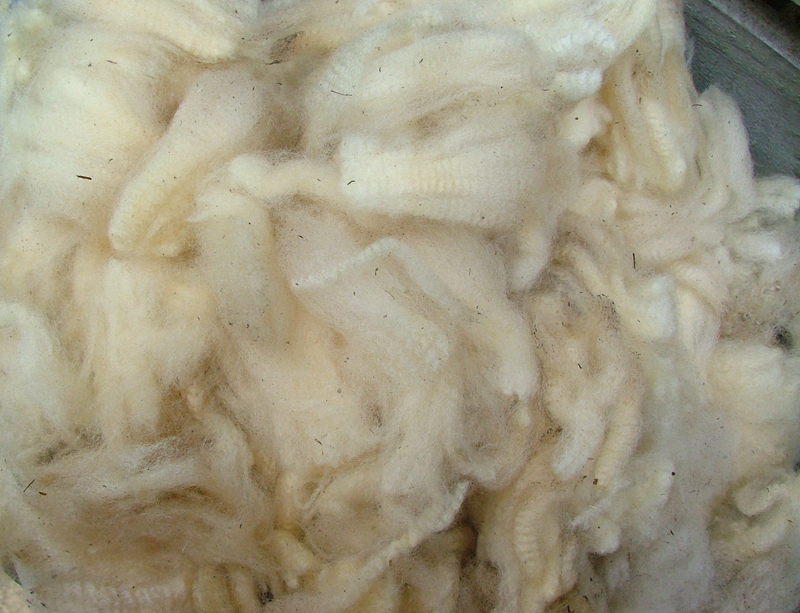 I had a good look at the one fleece before saying I'd take it, but the other one I just said I'd take it having seen a few locks at the top of the bag - it looked lovely and long, was soft and pretty clean for a sheeps fleece. I got them home and thought I'd get them skirted straight away and wash some too. 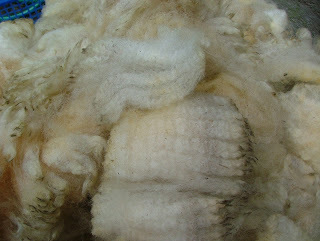 The shearling was lovely, although very dirty - pictures below as a bundle (doesn't that look lovely! 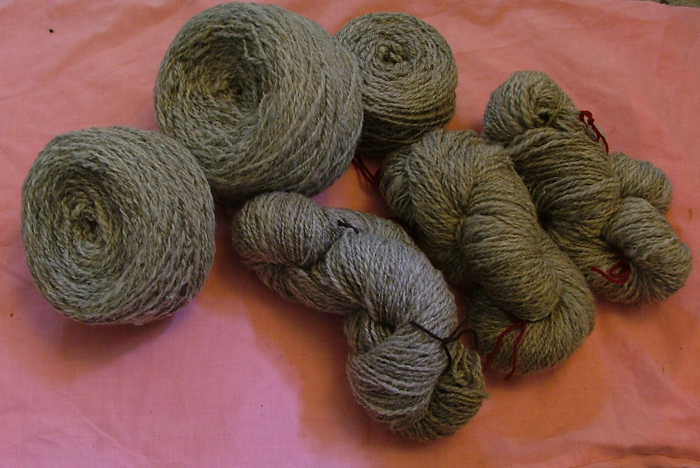 ), laid out to skirt and sort, close-up of the locks and after a wash. Lovely. So soft and sitting waiting to be carded and spun now. 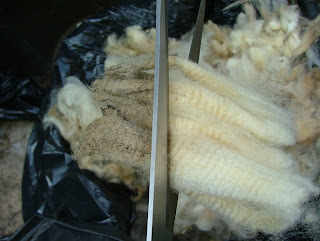 The second fleece was skirted, looks good, and has been put to one side to wash another day. 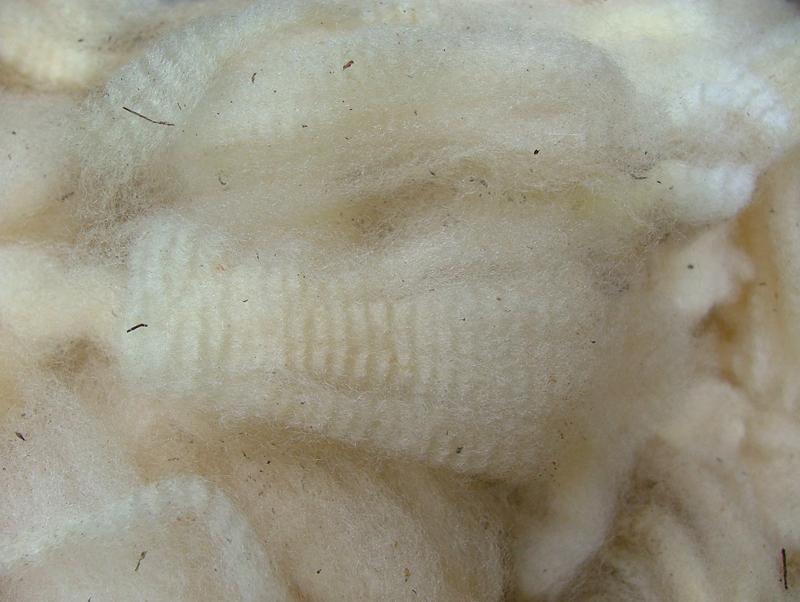 The third fleece? 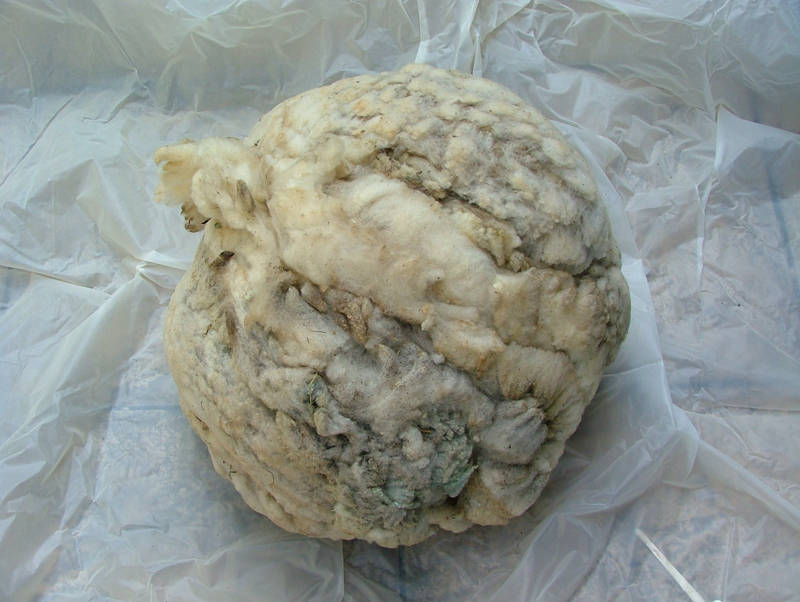 Well this reminded me of something I've been told and read many times - always, always lay a fleece out and have a good look at it before you take it home. I didn't. 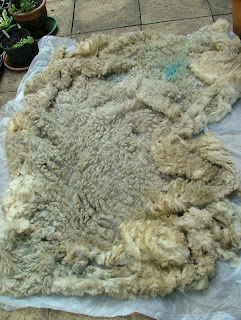 So what greeted me when I laid this fleece out? It looked lovely and crimpy, nice off white which I knew would wash well but with very dirty and distinct tips. 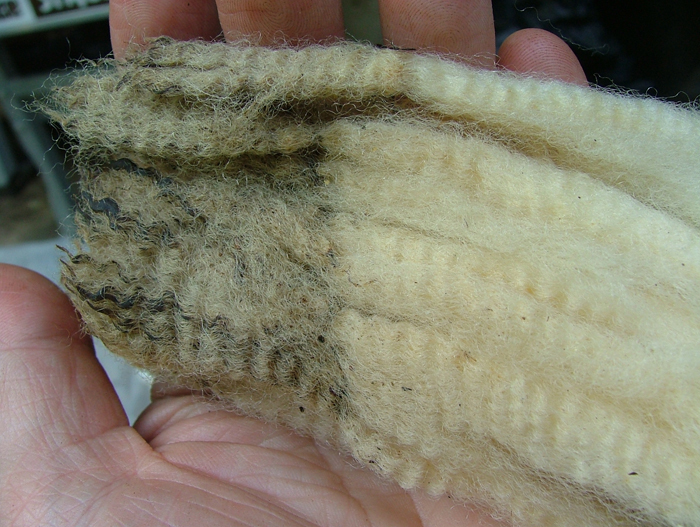 A closer look and I could see why - this fleece had a break in it! 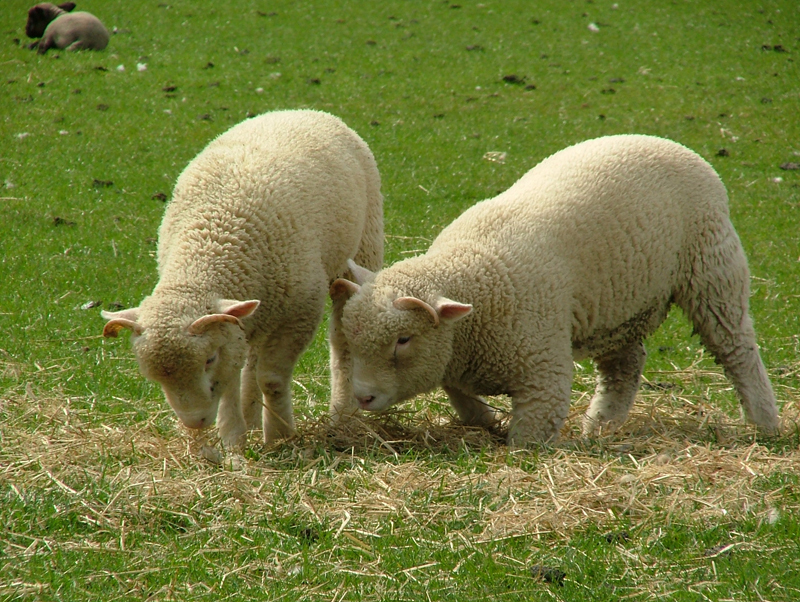 A break in a fleece is a sign of stress to the animal at sometime, maybe an illness. It was quite near to the tip and luckily beyond that was lovely crimpy wool with a good staple length, about 3-4 inches. So what to do? I know many people would just scrap it and chalk it up to experience, at least it didn't cost anything ... except a 50p donation. But that's not my style. I pulled a few locks out from random places, broke off the break and then tested the remaining lock for strength. There was a very good twang to it showing that the rest of the lock was in good condition. So what do you think I did next? Yep, I cut the tips off at the break! Something considered wrong in some spinning circles - cutting the fleece, but I like to do things differently and try other ways. It took a little while sitting and taking off the tips either by hand or with the scissors. As I was doing this I was also picking out as much VM as possible too and the locks were basically being teased open so I now have a lovely bag of fluffy locks, reasonably clean too. The moral to this tale is to always take a good look at a fleece before taking it home (unless you're buying online! 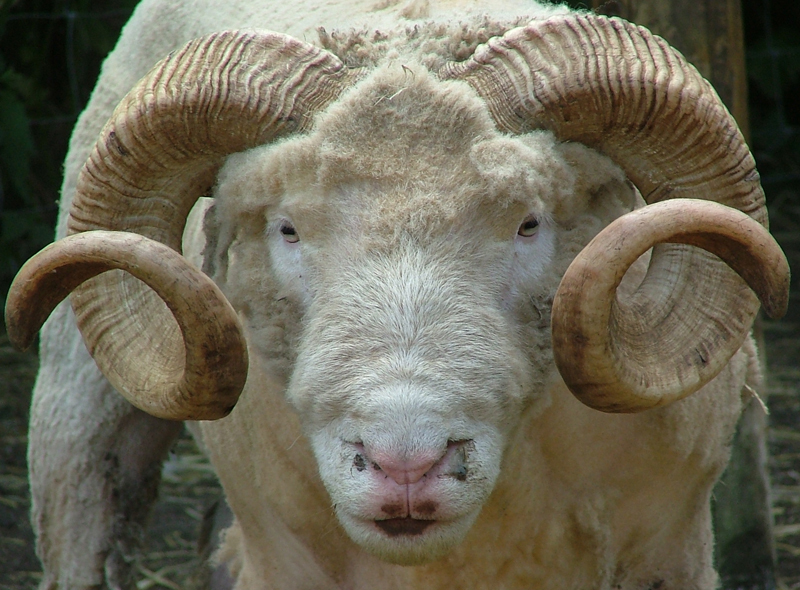 ), but you may be lucky like I was with this one and end up with a lovely bundle of fluff. 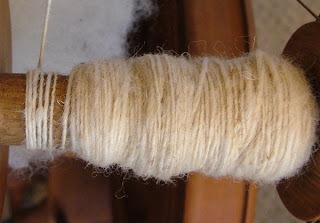 With fleece acquiring, washing and writing articles for the newsletter I haven't done much spinning this month but have started on that Portland fleece from my last post. It's going nicely so hopefully I'll have more of this done soon. I also wanted to share with you a picture of the Zwartble I was spinning for a while - here are 3 balls and 3 more skeins awaiting the finishing wash (I'm sure there's another ball or skein somewhere too) - over 1kg of lovely spun wool about worsted weight awaiting a pattern. 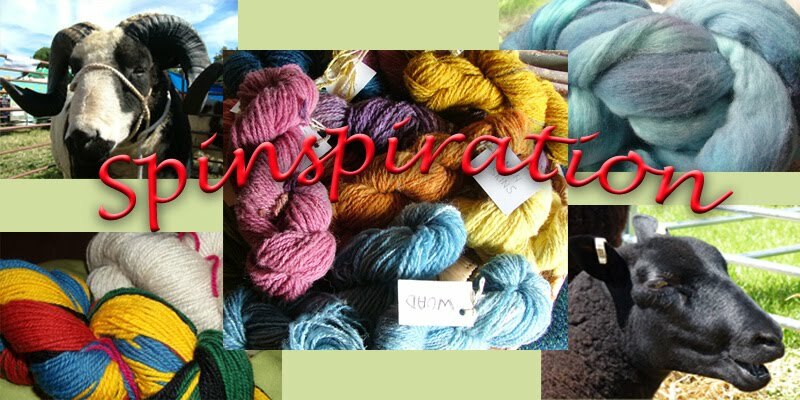 I have had some ideas and plan to get something on the needles perhaps in the Autumn.